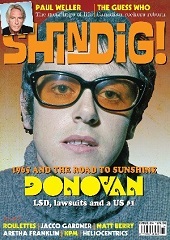 Donovan graces the cover of this issue: The Bohemian Manifesto, phase one. The Kinks: “Village Green”… photo exhibition highlights. The Roulettes: So much more than Adam Faith’s backing band. Jacco Gardner: … does medieval sci-fi. The Guess Who: A Canadian beat band’s journey to chart-smashing rock. It’s A Happening Thing: Featurettes on KPM, Matt Berry, Groovy Uncle, Heliocentrics, Mystic Braves, Bird Streets, Mark Sultan. Happening Right Now: The hottest new bands. Family Album: “Lady Soul” Aretha Franklin’s 1968 classic. Deep Cuts: Garage and psych interpretations of soul hits. 20 Questions with Paul Weller: His past, present, and future. Plus reviews on the best in reissues, new releases, books, and live shows!